Abundant sunshine. High 74F. Winds SSW at 10 to 15 mph..
InterSeeder is a multipurpose machine that simultaneously plants three rows of cover crops while spraying post-emergent herbicide and nitrogen fertilizer in single passes between four or six rows of knee-high corn. 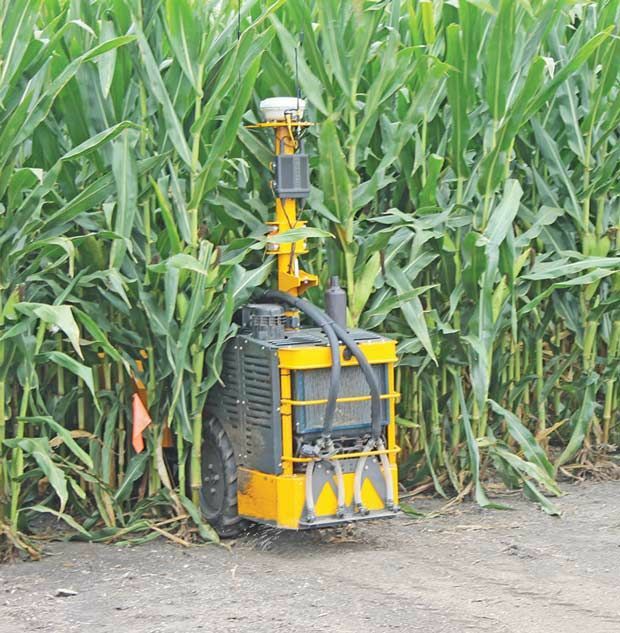 The Rowbot was initially designed for nitrogen applications between 30-inch corn rows, and is being adapted to plant cover crops. Cover crops can help improve soil quality, fix nitrogen for the following crop, supply rescue forage and can lead to improved ground and surface water quality. Last September, Nick Leibold of New Hampton, Iowa, had oats and radish cover crops aerial seeded before he started harvest. Other farmers across Iowa also used aerial seeding. As cover crops become more popular, more machinery options to plant and manage them are becoming available. Now, manufacturers and researchers are bringing their products to market. From interseeders to highboys or even robots, there is new innovative cover-crop seeding equipment available. Manufacturers such as Hagie Mfg., Salford Equipment and Dawn Equipment are plunging into the cover-crop seeding business in addition to startup companies. Researchers at Penn State developed the cover crop InterSeeder and applicator, a semi-mounted machine that can seed cover crops into standing corn, sidedress nitrogen and apply herbicides in one pass. Two developers, Cory Dillon and Chris Houser, as well as Penn State weed scientist Bill Curran and Penn State agronomist Greg Roth were involved and have tested it. Last summer, the group launched commercial sales of InterSeeder, a multipurpose machine that simultaneously plants three rows of cover crops while spraying post-emergent herbicide and nitrogen fertilizer in single passes between four or six rows of knee-high corn. The proprietary all-in-one unit, which converts to a no-till grain drill, is the culmination of four years of field tests conducted during on-farm trials by Penn State in collaboration with the USDA, Cornell University and the University of Vermont. Field trials verified that mixtures of annual and perennial ryegrass, clovers, radishes, alfalfa and other grasses provide cover during spring and fall that prevent nutrient runoff. Cover crop winter root growth also captures and retains nutrients and replenishes soil. An all-season implement, InterSeeder operates with a 90-horsepower tractor for planting wheat, cereal rye and soybeans, and its 10-foot length allows easy hauling on roads. For more information about InterSeeder, visit http://www.interseedertech.com/index.php. Rowbot Systems, based in Minnesota, offer machines to sidedress and/or seed cover crops on standing corn acres, according to Kent Cavender-Bares, CEO and co-founder of the company. The Rowbot machines have diesel power, a hydraulic four-wheel-drive system and are GPS guided, although a sensor-based system may be in place this year. The 20- to 22-inch-wide, 7-foot-long machines have a 40-gallon aluminum tank for sidedressing UAN and four nozzles on the rear, along with a small seed hopper for cover-crop seed. Gandy Company, based in Minnesota, continue to offer new models of the Orbit-Air line of pneumatic applicators for seeding, chemical and fertilizer applications. The new 6245RDS24-S has an approximately 36 bushels/1,800 lb. granular chemical capacity, 12-volt drive, 24-outlet applicator with independent left and right discharge, 8-GPM remote hydraulic blower and assortment of metering wheels for small seeds and grains, plus granular chemicals. The new 45 cu. ft. Orbit-Air can be placed lengthwise on a vertical tillage tool so it can slide under folding wings. And, with its independent left and right discharge, tubing can be directed to each wing without unnecessary loops. “Customers can mount the unit on their vertical tillage tool and run tubing directly to each wing, eliminating bothersome bends and loops,” says Doug Snorek, sales and marketing manager. The Iowa Department of Agriculture says farmers continue to expand usage of no-till or strip-till to limit runoff, improve water quality and reduce production costs. The department, in conjunction with Iowa Learning Farms and Iowa State University Extension, put together information to help farmers. 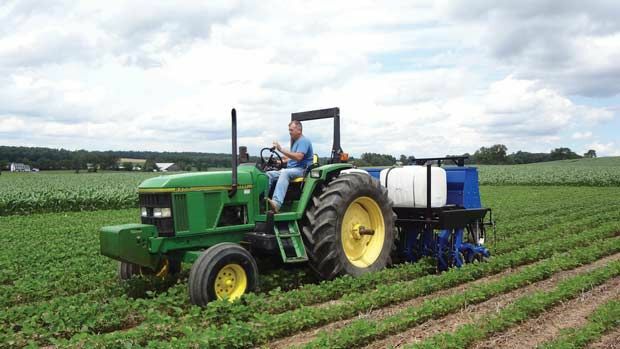 A fact-sheet has information on planter settings, fertilizer considerations, weed control and other considerations to help farmers successfully use no-till and strip-till in their operation. The information can be found at www.cleanwateriowa.org/nostrip-till. Iowa Learning Farms also has a YouTube video on planter settings for no-till operations at http://tinyurl.com/pyuxw3j. Additional videos on other aspects of planter settings are on YouTube, which can be found at http://tinyurl.com/n7teotg.